Hey! I'm Leeann. I created Fit & Free ATX on May 3, 2018. There were two things that week that prompted me to make this page. First, I had been looking up different gyms and studios in the area and was really bummed out at the high cost of fitness. Second, I had attended a free group run and had a ton of fun. While there, I heard about another event the next day with a different group. At that point I realized there were lots of free events out there, but all of them weren't listed in a single place. So I bought a domain, set up some pages, became way too knowledgeable with Google Calendars, and here we are. My only goal for this page is to save people money while helping them live a healthier life. Whether that means eventually sending out daily event newsletter, collaborating with local studios, or creating my own events, I'm here for the ride. So if you're interested in chatting or working together, drop me a line! I'd love to hear from you. Fun fact: the photo on the page was taken after I went out on a run and came back to find all of my chickens had escaped into my front yard. 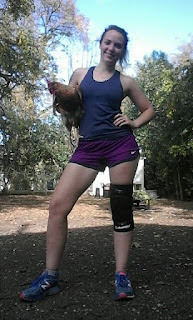 I spent a full 10 minutes wrangling them into the backyard, and posed with Becky the chicken at the end.